Saints snowman. Jen’s family got tons of snow yesterday. – stevenjen - Quit our jobs and bought a Westsail 32. Now what? 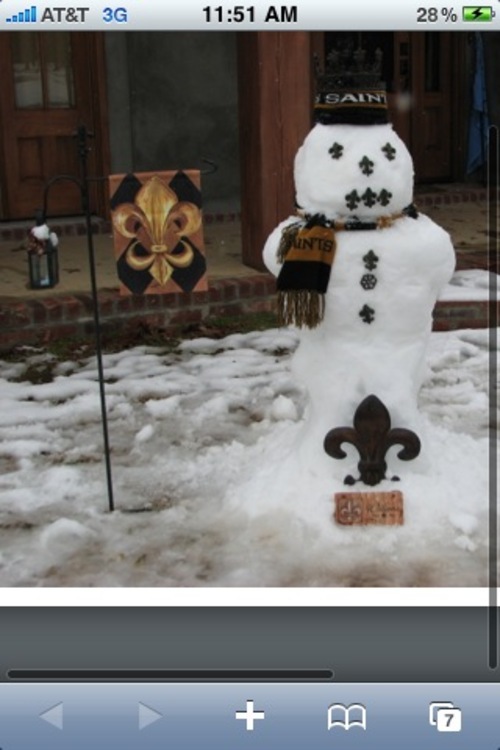 Saints snowman. Jen’s family got tons of snow yesterday. 3 Comments on Saints snowman. Jen’s family got tons of snow yesterday. That is a FANTASTIC snowman! Who Dat!! Aunt Liz made the snowman. I’m sure your snowman would be so massive. Hope to see a pic of one soon. I don’t know if you remember me, but I am one of your cousins in South Carolina. I haven’t talked to you since we were little though. Your Aunt Liz came with the passing of my Grandma and I asked her about you…she gave me this website….how fun! I hope you are doing well and just thought that I would say hello! « Dinner at the hut with Dave and B!